A sudden rush of energy to the hands. Does wonders for clearing things off your to do list and making way for new projects. The little baby wrap top is finished. 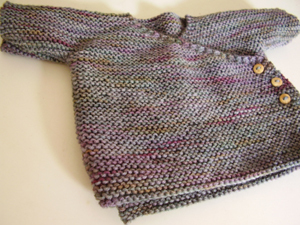 Same simple pattern as many before - the kimono wrap top from Erika Knight's book Simple Knits for Cherished Babies. Always looks great on newborns, without a doubt, and the simplicity and quickness of making it means you can't get too upset if bub grows out of it quickly. The yarn is Martas Yarn, and 3 little timber buttons finish it off. Left over yarn will go towards the babies quilt as well. I took everyone's comments on board from my post last week about the quilt and appreciated all your input into quilt selection. While I had originally had my heart set on the log cabin idea, the quilt in sketch No. 1 has really been getting me interested, and I think given the final choice of materials, will work the best with the strength of colours and patterns. Di did indeed come through with a fabulous selection of materials to add to the group, and some which will become other things. I now also have sifted through boxes and pulled out a range of coordinating wools that I can sew into sections with different textures to add to the whole affect. My fingers are indeed itchy. But somewhere along the line yesterday I got the Mother Guilts. Max's quilt is teasing me from under the table where it has lain for a couple of months untouched (note: probably not the best place to leave it because the cats have slept in it...). 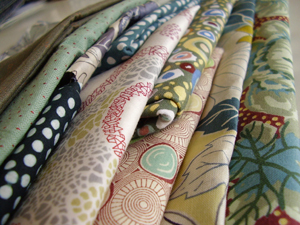 A few quiet-ish hours this weekend and I sped through a chunk of what little remains on the hand quilting. I have 17 circles and bubbles left - 2/3 of those are small ones, and I figure if I work hard this week through the evenings, I can get the hand quilting part finished ready for the backing and edging. I'm going to feel terrible if I haven't at least got Max's quilt pretty much finished before cutting out the new quilt. We're not quite ready to deal with sibling jealousy just yet. 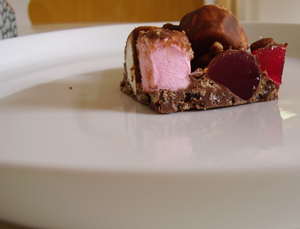 Nicole's Rocky Road recipe. Brilliant. And homemade calzone which isn't from any recipe, except for the dough which is Jamie Oliver's basic bread recipe. Inside: Ricotta and spinach with fresh tomatoes from my mother in laws garden, a sprinkle of salt, pepper and cinnamon, and some lemon rind, all topped with fresh basil and tomato sauce, ingredients again from the garden. Damn nice. especially with Rocky Road as a starter, and a dessert, and with tea later. And finally, thankyou all so much for such wonderful supportive comments about doing a book. I've done a lot of thinking about it over the last few months, and I'm pretty keen to do it. Given what else I manage to do in my life, a book will fit in, and it's an opportunity I'm not prepared to turn down since it's been offered :: so here's hoping the publisher really decides it's viable. Fingers crossed. I meant to comment earlier, but it seems you think in a very similar way, as you prove in this post! I was going to say quilt #1 because it's YOUR style. And I was going to say that you should definitely consider the book (if it doesn't sound as good further down the road, you can always change your mind, but it would be a shame to not explore the idea). 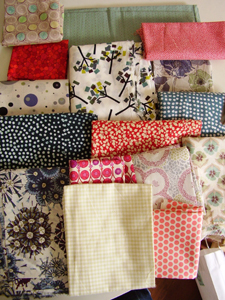 Di's selection of fabrics is beuatiful and I love the baby wrap. That baby sweater is the cutest thing ever! Oh, good. I'm glad you're going for the book. And I hope it works out, because as I mentioned, you're one of my favorites. And all good to you. Your baby clothes are always lovely. That baby sweater looks so elegant. Nice job. I don't have the directions but I was thinking of using a one piece sweater pattern and try to make the " wrap " front... It looks as tho after the neck opening you started increases on both fronts, right??? Are the increases everyother row ? And are they maybe 2 stitches at the end of everyother row until you get the front width across??? Hummm... I think maybe that should work??? Do you think??? Thank you for any advice.. Yes, kimono top good - thanks, just in time, I was thinking of learning to knit for my son now that it's getting cold (I probably could have started a bit earlier, before it got cold, but never mind) and the simple knits book is looking like a good place to start. Cheers to you and serendipity. I love wrap tops! so cute! And food AND fabric! So yummy! That kimono top is divine! Beautiful kimono top. 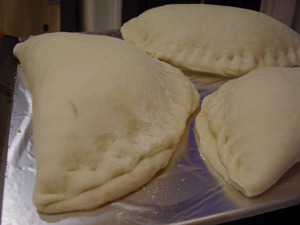 The calzones look divine, I must try your recipe! hello. i love the kimono wrap. the color is gorgeous and it looks so comfy! Backtack 4 is now closed - stayed tuned for Backtack5!